Using LaTeX one can produce fancy posters for conferences. There are quite some document classes available on the net, but not all of them are that great. On this page I'd like to demonstrate my own evolution. I made my first humble poster for a conference using sciposter , which is rather easy to use but feels a bite like the late 1980s. After getting to know the beamer class for presentations I made all my other posters using the beamerposter [1,2] class, which — simply said — is a modification of the beamer class. sciposter is a very traditional class. The documentclass is similar to the classical article or report classes and offers a series of special or customized commands for the purpose of creating posters. Most of these commands regard the header of the poster. 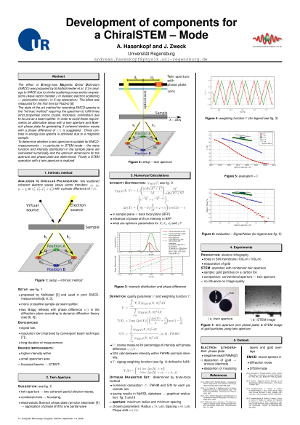 Using only the sciposter class posters look a bit "old school" as can be seen on my poster for the EMC14 in Aachen. Also the project on CTAN seems to be abondanoed since 2006. One can pimp the style by redefining e.g. the section-command by using custom colored boxes with TikZ as in my poster for the IMC17 in Rio. Two of my posters produced with sciposter. But still this document class has more in common with the article class than with a poster made with a graphics program. beamerposter is a more modern alternative and based on the beamer class for presentations. The document is designed like slides for presentations. People already familiar with the beamer class will find quite some features and commands from the beamer document class. Authors will consider the arrangement of content in block and columns environments as very useful. As example you can take a look on my poster for the MC2011 and MC2013. One major drawback of the beamer(poster) class also derives from the nesting of environments — just like when nesting minipages: Footnote texts are not collected in the bottom area of the document, but in the bottom area of the environment. A very useful feature inherited of the beamer class by beamerposter is the theme capability. By defining themes one can design posters according to current corporate design standards or render older posters quickly in the new design. For further information on themes and styling see this page. In order to get started, feel free to have a look at the LaTeX source files. Please note that I have not uploaded any further files, which are required by those files. Feel free to replace images and BibTeX references.